Mike Lindberg knows what data analytics is really about at today’s credit union: building strategies based on member insights. 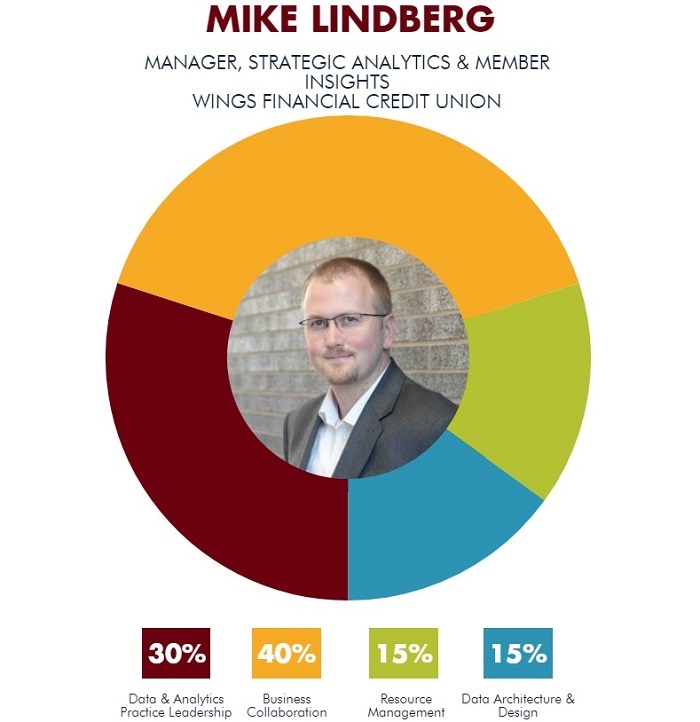 That’s why when Wings Financial Credit Union ($4.7B, Apple Valley, MN) created its strategic analytics and member insights team in 2016, it put Lindberg in charge. Lindberg began his career as a systems analyst at the Twin Cities credit union in 2003. He left in 2008 and returned in 2014. Today, his job includes not only helping the organization better understand its stores of member data but also helping the business units leverage that intelligence to innovate and improve products and services. What’s A Culture & Values Officer? In the past, business intelligence and analytics were dispersed throughout the business units, mainly in finance (organizational and financial reporting), marketing (campaign reporting and member analysis), and information services (BI, analytics, architecture, development). Today, Lindberg is responsible for unifying Wings’ approach. Here, Lindberg describes what he does as strategic analytics and member insights manager. Why did Wings Financial create your team and role? To stay on top of his role as strategic analytics and member insights manager at Wings Financial, Mike Lindberg does a lot of reading. Here are his top picks. Mike Lindberg: Wings Financial has a team of leaders who have significant knowledge and experience in how to drive value back to our membership. In 2013, our CEO challenged us to become a data-driven organization. At about the same time, I came back to Wings as a data architect and began working toward understanding how we can use data to serve our business leaders and members. The team and my role were created to unify the three areas that had parallel responsibilities in the organization and create a center of excellence for business intelligence and analytics. The department name recognizes that the information products we deliver should focus on applying analytics to our business strategy and developing further insight about our members. We exist as an organization to serve our membership, and the insights team focuses much of our efforts on identifying ways that our members find value at Wings. Our team works with business leaders to provide that value to our individual members. Did the credit union create this role for you? ML: Short answer, no. Longer answer — I was blessed to be able to work with several senior leaders to create a vision for an analytics center of excellence. With their guidance and support, Wings created the team and focal areas and offered me the opportunity to lead the team. What made you a great fit for this job? What do you look for in your team members? ML: My role is best carried out by a person who is constantly looking for, finding, and creating opportunities to serve others in the organization and our members. BI and analytics also require the ability to disassemble complex concepts, simplify their components, and apply them to the organization in meaningful ways. Curiosity and being willing to ask the questions that most would not ask for fear of looking dumb are up there, too. There are technical skills that are required, but I tend to not lead with those. You must choose between being technically perfect or having the business use the solution. We choose every time to have the business use the solution, although we also have some exciting usages of technology, too. When looking for team members, we focus on soft skills and aptitude and train for technical skills. The technical skills that provide a good foundation for analytics are: strong SQL language knowledge; knowledge of data warehousing; data visualization, we use Tableau; data integration; business analysis and how to ask the right questions; consultative skills for delivering the right solution. ML: My day typically starts at the end of the previous day, when I review items to be delivered, meetings, and upcoming conversations for the next day. The insights team and I generally come in early so we can tackle a few challenges before the day begins for the organization. We have a team stand-up each morning to share what’s expected and plan out conversations to help one another succeed. From there, my day is generally filled with meetings. Each of the analysts on the insights team is responsible for the relationship with a handful of business units, so meetings with the business unit leaders and/or project teams are a regular occurrence. As a team, we have much more work to do than time available, so I help our team members prioritize and focus on the solutions that drive value to our members. When not in meetings, I do my best to learn what the folks on the insights team are seeing in the business and work on applying that to finding ways to collaborate with business units to enhance the ways we can serve our membership. I’m surrounded by people who know more than me about things — both technically and on the business side — so I try to learn as much as I can from them and do my best to apply what I’ve learned to others in the organization. The fun part of my job is that my days never look the same. The insights team and I receive requests daily for new and different opportunities to help others. There is great excitement in building something new or helping solve a problem that will ultimately benefit our membership. ML: From a numbers perspective, we track our requests in our IT ticketing system. Fulfilling our service-level agreements is a key metric to our success. Much of what we do is more on the qualitative side, where we focus on the relationship with each business unit. We have a survey that gauges where each business unit is using the insights team and another in which the business unit leaders score how they feel we are serving them. Requests coming in and interest in using data and analytics from the business side is our most accurate assessment of data culture in the organization. When we have more requests than time to fill, then we’re in good shape. We define a healthy queue as more than 100 items waiting to be completed. We’ve had a healthy queue for as long as the team has existed. ML: The insights team is four analysts and one data scientist. Daily, I’m impressed by the ownership, skill, and desire to serve that each of them brings to work. The team functions like an internal consulting unit, which makes all of us focused a little bit more on serving the business. Each of the analysts function as solutions architects to the business units they are responsible for, and our data scientist is there to help apply statistics, machine learning, and more of the fancy data science in our organization. We also have summer interns in our data science practice and data practitioners that help us serve their business units. An internal program at Wings Financial builds serious data skills for interested employees. Learn more in "How To Embed Analytical Minds Across An Organization." I report to Brad Grant, who is the vice president of information services. His leadership has been instrumental in helping the insights team succeed. Having said that, I’m also lucky enough to be guided by a data strategy board that helps direct and strategize how to become a data-driven organization. What other roles or responsibilities are similar to yours at other credit unions or non-credit union organizations? ML: There are plenty of similar roles out there, including managers, AVPs, and VPs with teams like business intelligence, analytics, R&D, innovation, strategy, data architecture, and data officer or data governance.